Retro hairstyles can be considered as the old but gold. There are some old haircuts that can give you a new look. You can arrange your hair in various ways to get new looks according to your purposes. If the theme of your party is retro then you can pick any from the following Retro Hairstyles for Men to rock it. These stunning hairstyles are also very easy to manage and maintain for a long day. You just need to check whether the hair is perfect for your dress, purpose and personality. These stunning haircuts are suggested by the professionals who know how to keep your hair manageable and attractive at the same time. You can part your hair from side or middle to get these appearances. You can also use some good quality gels to hold these styles for days. The hairstyle has been ranked among the most excellent hairstyles for many years. It is a medium haircut suitable for people with soft hair that can be combed in different directions. The fringe hair is typically combed backwards. The side part haircut perfectly suits any event whether casual or official. The side hair slowly fades in descending order. Lastly, people with no beard can incorporate this hairstyle. There are a number of beautiful hairstyles looking at which all you can think of is how good it would look with a suit. This is one of those hairstyles. This Slick Side Hairstyle and also sharply tailored suit are all you need to create an impression. Make a side parting on one side and then brush the hair well. On the side of the parting that has more hair, brush it back and puff it up. It is a low fade hairstyle with a wave. The Pompadour Hairstyle with Side Slick is suitable for anyone with the medium soft hair. Soft hair makes it easy to design the wave. This hairstyle slowly fades away on the side and the back. Pompadour slicked hairstyle is considered both an official and casual haircut. In addition to all these, this haircut encourages people to keep short beards. It gives you a ravishing look. Some people find fringe hair cumbersome at time times. Well, the beautiful Swept Back Hairstyle is quite beautiful to look at. This is a simple hairstyle that requires your fringe hair to be combed backwards. You can slot in a blow out to make this simple for your hair to remain steady when being combed. The swept back hair also encourages the systematic hair fade going sideways. The Messy Hairstyle for Thin Hair can be cut in the short length to look gorgeous. The curly hairstyle on your scalp looks messy and uneven and casual at the same time. It can actually create the look of your hair thicker and manageable. The blonde color of the hair can also give you a trendy and smart appearance. It is one of the excellent hairstyles, which gives you the ravishing and bold look as well. This is one of the beautiful hairstyles, which give you the bold and smart look. Use the accurate hair product to give it remarkable hair volume. The Undercut Hairstyle for Men style works well along with the thick hair, which has an excellent density. This particular hairstyle is absolutely unique and stylish to wear it with any clothing. It is one of the excellent hairstyles, which gives you the bold and smart look. You will have to admit that this is quite an edgy look and you need to really be ready for a hair experiment if you are planning to try out this one. 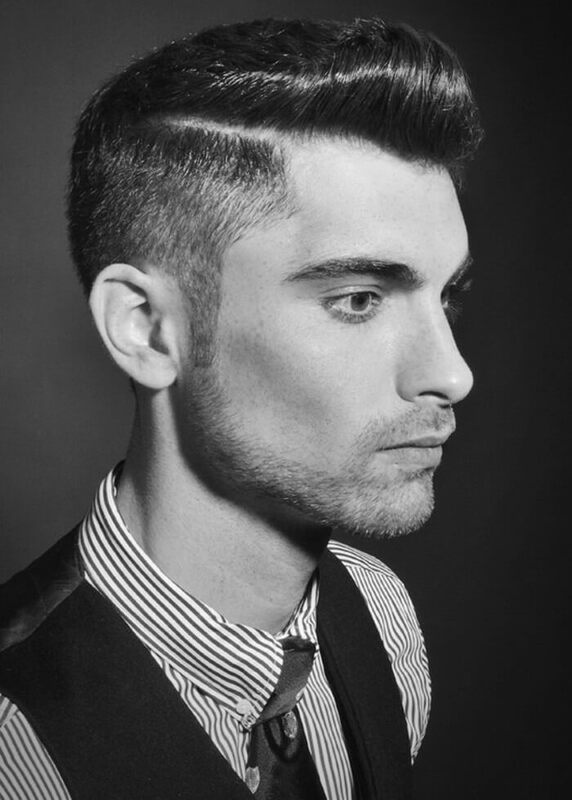 Comb back your slick hair and make both of the sides fade to create this specific hairstyle. The hair below this demarcation is totally shaved off leaving the skin bare. The hair in the center is swept backward, and your look is ready. It gives an edgy and absolute smart look to your personality. If you are opting for the extraordinary look, then trying this Wavy Pompadour Hairstyle is one of the excellent styles, which give you a fashionable and bold look. In order to create this look, you have to fade both the sides of your hair and then give a messy and uneven look as well. The entire, wavy look actually helps you to stand out amongst the crowd. This Textured Quiff Hairstyle is actually for the people who want to look bold and smart. In this style, you need to part the hair from a side. The sharp edges of the hair strands can give you a prominent and bold look. The brownish shade of the hair strands in this style looks perfect. This is one of the excellent hairstyles, which absolutely looks beautiful on you as well. The Blonde Comb Over Hairstyle is absolutely unique and exclusive. They are stylish, elegant, and fashionable. This comb-over hairstyle is neutral, simple, and very basic. The hair has the perfect length both for the sides, the back, and even the midsection. Use the perfect comb to style the hair. Comb it back, and it will give a little straight and sleek look in your personality as well. If you have a little long and blonde hair, you can easily go for this hairstyle. The 1950s Retro Hairstyle goes perfectly well with the full beards. You have to comb back your hair in backward, but it will provide a little uneven and messy look as well. It looks quite classy and elegant. It is also neat, and with perfectly shaped beards, you will be at your best. This adds a little charm to your personality. A Slicked Back Hairstyle has got the sort of cult status in recent times. The exact style quotient adds to your entire look is the reason behind the popularity of this hairstyle. Setting blonde hair for this one is pretty simple. Get some hair wax or gel in your hair. Take a wide-toothed comb and brush your hair backward. If you have a short and blonde hair, you can easily try this one. This amazing style is all about flaunting your widow’s peak. So, the men who have widow’s peak but are not actually afraid to try something exceptional in terms of hairstyles are the right people to give this one a go. The Slicked Hairstyle for Receding Hairline has been called easy because this is nothing but a simple swept back hairstyle. But in this case, you sweep back your entire hair and not just the longer portion of hair that is at the middle. This is a low fade hairstyle with a wave. The Swept Back Pompadour hairstyle is quite suitable for anyone with a long soft hair. Soft hair makes this simple to wave. This hairstyle slowly fades away on the side and the back. Pompadour hairstyle is also considered both an official and casual haircut. In addition to all these, this haircut encourages people to keep short beards. It helps you to look stand out amongst the crowd. 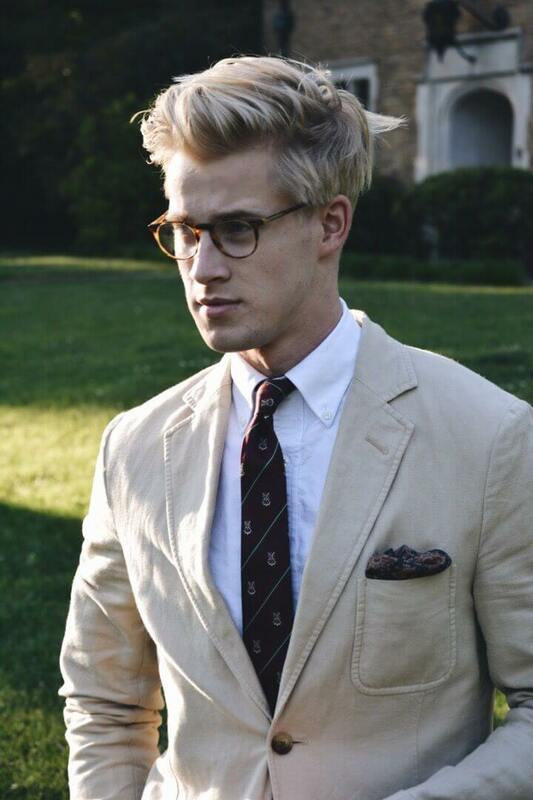 Men who have short and blonde hair always look for the exclusive style, which is utterly amazing for you. 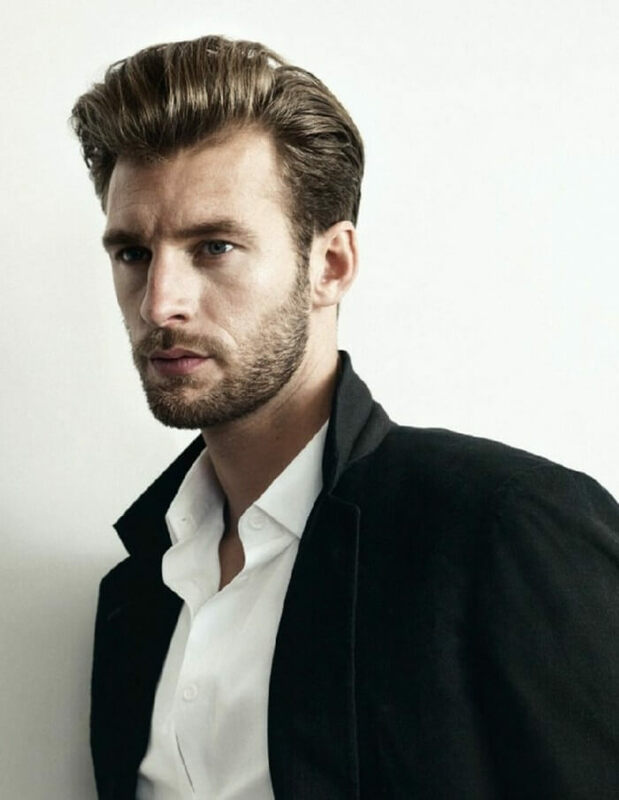 This Hard-Slick Back Hairstyle is one of the brilliant styles that a man can wear. You have to comb back your entire hair to get the look, and you can also add some hair gel as well. It adds an extra charm to your personality. This is absolutely amazing hairstyle to look at. When you opt for the excellent hairstyle, you have to make sure that you choose this one. The Finger Wave Hairstyle looks absolutely amazing on you. You have to create the hairstyles by making some waves in it. If you have a blonde and smooth hair, you can go for this look. This is an exceptional and unique hairstyle, which gives you a wonderful look for sure. There are many complaints from people with thick, soft hair in that there have limited hairstyles. Well, carefully look at this quality haircut, which each and every individual is talking about. This is even a fade away haircut signified by a lot of middles away that significantly reduces going downwards. Quiff haircut gives men the opportunity to show off their fringe hair. The High Fade Pompadour Hairstyle offers people an idea that there should be plenty of hair in the middle of the head and short hair on the sides. This is what has made this hairstyle famous among people with lengthy blonde hair. This hairstyle is made for blonde hair as it easy to comb into different designs. If you want to get a smart and neat look, then you can style your hair in Gelled Side Part manner. You need to add some good quality hair gel to get this neat look. Then comb the hair from a side and slightly back brush the front hair before combing in a side ward manner. This style looks good on thin hair volume as well. If you backcomb your hair your face become more prominent and bold looking. You need to set the hair with some good hair gel to hold the style for a long time. In this style, your short straight hair looks great. A side partition on the hair can give this style more prominence as well. You can try this style on your highlighted thin or thick volume hair to get an ultimate classy appearance. Side shaved style on your straight hair can give you a bold and smart look. Your highlighted ash color hair is needed to part from a side. Then you need to shave the backside of the head and one side. Keep another side longer and comb in a frontward manner. This style can hide your hair volume and give you a prominent and perfect look. The curly hair can be styled in scruffy manner to make your appearance bold and trendy. In this style, you need to back brush your hair and set with a light hair get. The curly hair ends can give you a unique and smart appearance. This can also make your facial shape round and hide the hair volume at the same time. People who want to look bold and appealing in the crowd can cut their hair in the gangster style. In this style, you need to back brush your hair neatly and use some good hair gel to hold the style. The highlighted and straight hair strands look perfect in this style. People with thick hair volume can choose the preppy hairstyle to do justice with their appearance. In this style, the sharp ends of the hair and different hair strand lengths can give you a messy yet smart and bold look. This style looks perfect on shaded hair color. You need to comb the hair from a side and to make this haircut more prominent and manageable.